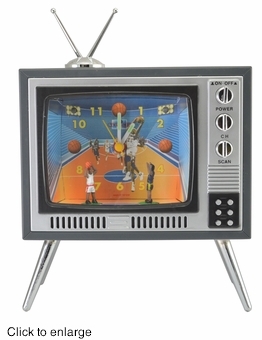 Arise to the sounds of the basketball arena with this groovy retro vintage 70s style TV basketball alarm clock. This fun fantastic sporty alarm clock has an easy to operate simple alarm function where the on/off button controls the alarm sound and the alarm is easily set with a twist of a knob on the back of the clock. When the alarm goes off, the arena inside the TV comes alive; the dribbler and defender twist back and forth, arena lights flash and you can wake up to the bouncing of the ball, the swish of the basket and cheering and celebration of the fans. This is then followed with a lively playing of the ole' song to celebrate the basket. This is not an alarm that is easily ignored. Makes an awesome birthday or office gift. Each clock is equipped with accurate quartz time keeping and luminous clock hands. The TV alarm clock stands 8 1/2 inches high with the antenna, 6 inches wide and 3 inches deep. Display screen is 4"x3"